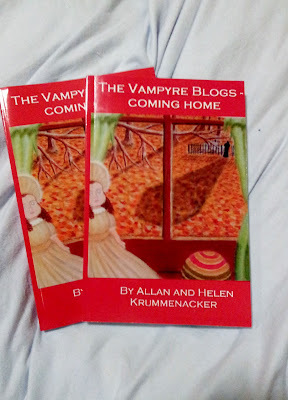 That's right folks, the proof copies of "The Vampyre Blogs - Coming Home" arrived last night at our front door, and we couldn't be more excited. For those who don't know what a "Proof" copy is, they are a printed version of how the book currently looks, before an author gives the final OK, on a book to be sent for publishing. This is the author(s) last chance to make sure the paragraphs are aligned correctly, the page breaks are clean, no words are being cut off, and to look for any final grammar issues in the text. It also give the author a good idea of how the front and back covers look, and that the image or words are not being cut off. In this case, we saw right away that there is an issue with the cover. The image is supposed to be framed by a red border on all sides, but as you can see in this photo the image is touching the edge. Naturally, we'll need to move it over to the left slightly. With the voice of experience, Mr. Gaughran shares his many insights of the world of publishing, and in particular self-publishing. 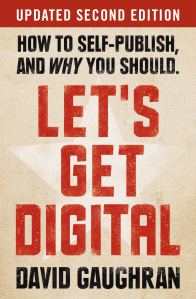 With the advent of e-books, many writers and would-be writers have found themselves faced with the opportunity to finally put out that book they’d been thinking about for years. Yet, they quickly find that the most daunting task, is not writing the book itself, but how to get it out to the public. Should they go the tradition route of finding an agent, and then a publisher? Can they deal with the countless rejections or avoid the scams that promise seeing their work in print, for a ‘nominal’ fee of course.